PART A: IT’S ALL ABOUT COLLABORATION! Mike Gasaway’s stories are never short on laughs and maybe that’s because he’s had a lot of practice, with successful results. 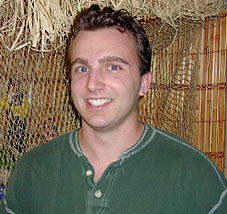 Mike was a director for several years on the Jimmy Neutron tv series and Barnyard, and has done his fair share of screenwriting, producing and pitching. He provided some of my most light-hearted memories of DNA Productions during episode reviews in Editor Joe Elwood’s office. His humor is contagious! You can tell he always enjoys what he does, and that’s reflected in his children’s book, “Little Mikey the Vampire Monkey.” It’s funny. It’s unique. It’s uniquely funny. I sat down with Mike to discuss some of his interests and his experiences in writing this book. KARA: Hi Mike. It’s a real treat to have you here today. Tell me about this adorable book, “Little Mikey the Vampire Monkey.” What lessons do you hope children learn from reading this story? MIKE: That if there is something that you are or possess that is not the same as others you are special, not different. Little Mikey embraces the fact that he’s not like the other kids and makes the most of his abilities. 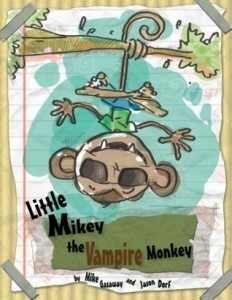 Little Mikey the Vampire Monkey by Mike Gasaway. Click on the picture to go to his Goodreads page! KARA: What discussions have you had with your own children, about Mikey? MIKE: They helped a ton with the story. We always talk about fun stories and fun characters. We all thought it would be great to have a monkey that was a vampire. Since I wrote a chapter book series too, they’ve been great little critics. KARA: You highly regard and listen to your kid’s opinions on your work and appreciate their feedback. What were some insights they’ve had that really surprised you? MIKE: They’re pretty sophisticated. I think that a mistake that writers may make is writing “down” to kids. They’re a lot smarter than we think sometimes. My oldest thought I was writing too young at first. I changed some of the style and made it more like the way I like to write and it meshed perfectly. It’s good to know that my sense of humor is right up the 10-14 year old alley too. It was great hearing my daughter read the book and laugh out loud. That was very gratifying. KARA: What were some of the fun moments that happened while creating this story? The artwork process? Working with Jason? MIKE: The fun part and the hard part was trying to make the lines of the story work on the pages. I had to rework it so many times just so it flowed nicely. That was a little weird to write that way. Having Jason send me artwork was very fun. It was like Christmas every time I got his artwork. I had very little notes on the process as well. Jason was simply great. He can do so many styles. This is one that he wanted to try and it worked great. KARA: What was the most challenging? MIKE: I thought it would be difficult not being in the same place but since he was in Dallas and I was in Ohio, it worked out fine. We used dropbox and sometimes were even working on the same files. I would get his art, add the text and then he would do those little sketches on top of that. It was a very neat process. KARA: A question for my writing and artistic readers who are thinking about self-publishing; what did you think of working with CreateSpace? Any advice? MIKE: CreateSpace was and is fantastic. I tried a few of the others but CreateSpace was by far the easiest. I haven’t used their marketing but for production it’s a no-brainer. It was a little hard to get the cover right but that was only because I didn’t understand all the terminology. Bleed is a completely different word to me since I like horror movies, so that was something I had to learn. Definitely take your time when putting the book together. I made sure not to rush anything and looked at the proof very carefully. KARA: Now, I heard there is another version of Mikey for older readers? A series? How are those coming along? MIKE: The series was completely done on accident…sort of. My agent at the time, thought that an illustrated book would be very hard to sell. So as an option, I started writing a chapter book. After a few days, it just took on a life of its own. I couldn’t stop writing. I wrote one long manuscript that I had my 12 year-old read and she said that it moved slowly. I wasn’t sure if I wanted it for her age group so I looked up how to write for 10 year olds on google. I found a site that said to write shorter chapters and try to leave them on a cliffhanger. I made the changes to the manuscript and found that I had to break up the story into smaller stories – about 70-100 pages each. The first book went to a proof and I let my 10 year-old read it and she couldn’t put it down. She was even mad at me because I left the first book as a cliffhanger as well. She wanted to read the second book immediately! So the series consists of three books that follow Mikey as opposed to Little Mikey. It’s a similar story but told in an older way than the illustrated book. I tried something different with this book too. I wanted to do an animated series where the main character would interrupt the show like a Malcolm in the Middle. So I have Mikey interrupt the author in the book. He may get into an argument about how the events in the story went down. It gives a nice different feel to the book and adds a lot of comedy. I even have his body parts join in on the fun! 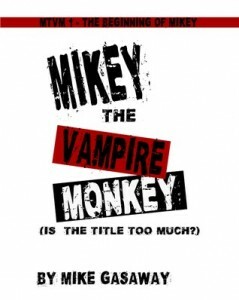 Mikey the Vampire Monkey by Mike Gasaway. Click on the image to go to his Goodreads page! KARA: Funny! I really enjoy reading your blog. Why did you decide to document the process of making a movie through a daily journal? MIKE: When I was in LA pitching my stuff to various producers, I kept hearing over and over, “How big is your current audience?” I thought that was odd since I had NO audience. There was a silly more adult series that I was working on that I posted on the internet and it was getting some hits. A producer told me to come back to him when I had a couple thousand hits. Honestly, I thought that way of thinking was insane. But then I thought. Look at the popular movies that were coming out. Most were already popular books. They HAD a following and a built-in audience. So I thought the best way to do it was through the social media outlets. I knew that people love to hear the behind the scenes stuff about movie and television making. I have a lot of stories from working on three television shows and one movie, so I wanted to get that out there. I also wanted people to hear about the movie from day 1. They would hear about how I come up with an idea, how I write the story and script and then what happens in production like storyboards and animation and so on. So far, the response has been very positive. My follower base is growing every day as well. The story that I’m crafting is another 3 book series. It’s an idea that I’ve been swirling around quite a bit and am very excited about. It’s about an orphaned 12 year-old boy who finds a pair of glasses that allow him to see into an alternative world, parallel to ours. He also finds out that he is needed in this world to stop an evil man from stealing the childhoods from children. There’s a lot of adventure because this boy has to find ingredients for a recipe to create a machine to fight the bad guy. I’m currently finishing the first pass and about ready to do the first rewrite. It’s been an adventure since the characters are talking to me now. That’s pretty cool and creepy at the same time. What I hope to have happen is the book will be completed and then people will buy that book. If it all goes to plan, the book will be pretty decent and people will talk about it. Thus, the built-in audience is created. It’s very grass roots, I know but I think through time, it will work. While there, make sure you like it too! The more the merrier! KARA: Where can young readers find your books? Anything new and exciting coming up, that you can share with us? There’s a tab that has the books on it that will direct you to the CreateSpace site. I am currently talking to a few people about creating a small company but it’s in the very early stages. It’s very exciting but most of my time is focusing on my new series. KARA: Excellent! Thanks for stopping by! What a really fun book. I like it. Keep writing so I can keep reading.